The Auto Meter Gauge Works single or dual pod mounting brackets are the custom way to mount gauges. 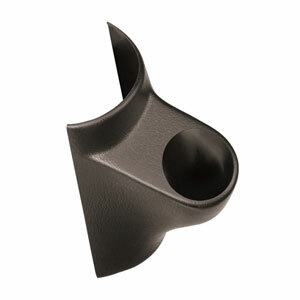 No more mounting cups or "frog eyes" cluttering the top of your dash. The Gauge Gizmo puts your preferred gauge up high, on the A-pillar, of the truck. The Gauge Gizmo fits over the top of and mounts to the factory A-pillar using four push-pin connectors. NOTE: NOTE: The Gauge Gizmo comes in molded black plastic. It can be custom-painted to match your truck with interior trim paint. had previously tried a different piller gauge mount from another source. it didn't fit well and looked pretty crappy. The new one from Genos fit like it should have and looks great.